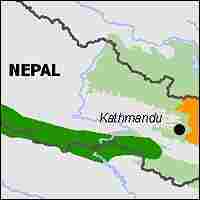 The greater one-horned rhinoceros is native to Nepal. Poachers have decimated most of the rhino population that was captured and relocated to a national park that's a key part of the Terai Arc wildlife preservation project. 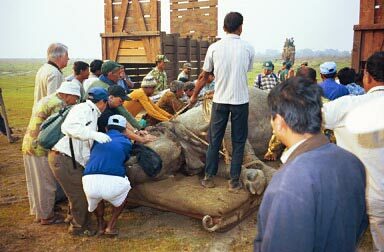 World Wildlife Fund and Nepalese conservationists monitor a sedated rhino's move from Chitwan to Bardia Park. A promising conservation effort to save one of Nepal's signature endangered species is now in serious trouble, due primarily to poachers taking advantage of fighting between government forces and Maoist insurgents. In 2001, the plan to protect wild areas in the country's lowlands appeared to be succeeding. 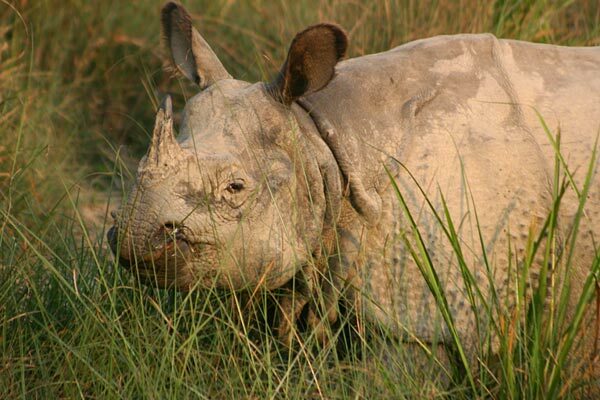 With help from international conservation groups such as the World Wildlife Fund, native rhinos (Rhinoceros unicornis, or the greater one-horned rhino) were moved from Chitwan Park, where there they were found in abundance, to Bardia Park where they are all but extinct. The relocation effort was a key part of a larger project aimed at preserving the wilderness area called the Terai Arc, a wildlife corridor linking Nepal's national parks and adjacent areas. But soon, army patrols in those parks -- sent in to discourage poachers looking to cash in on the illicit international market for skins and body parts of rare animals -- encountered a new problem: well-armed groups of Maoist rebels, who were hiding their forces and weapons in the wilderness areas. At first, rebel leaders reportedly told conservation groups that they could carry on their efforts. 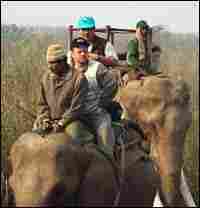 But in 2004, when a group of conservationists was detained and attacked, all but a few researchers were pulled out of places like Bardia National Park, on the western edge of Nepal's lowlands. Two years later, after the Maoists agreed to call a truce and hold talks with the government, a 40-man team was sent to Bardia to conduct a wildlife survey. They hoped to find that the 70 rhinos moved to the park since 1986 had survived, even without the protection of the conservation teams. 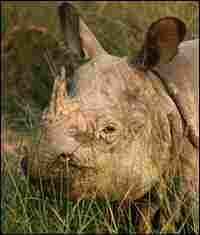 What they found instead was that all but three rhinos had apparently been killed by poachers. The speed with which the rhinos were wiped out -- 67 in two years -- puts the future of one of the world's most closely watched conservation programs in jeopardy. It also puts a spotlight on the vexing question faced by conservationists working in strife-torn regions all over the world. Eric Dinerstein, chief scientist for the World Wildlife Fund, says it is fortunate there are any rhinos left in Nepal at all. 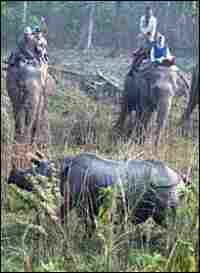 But he adds there's no evidence that the Maoist rebels did any of the poaching, and believes the rebels support the conservation groups because their efforts attract money to the region. Anti-poaching units recently began patrolling parks like Bardia again -- and so far, none of the units has been attacked by Maoist rebels.